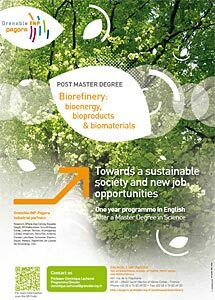 Grenoble INP-Pagora, The International School of Paper, Print Media and Biomaterials, has implemented a Post Master’s degree program “Biorefinery: Bioenergy, Bioproducts & Biomaterials” which will begin September 2011. Plant biomass is a source of energy, materials and chemical products whose vast and renewable potential is paving the way for a future less dependent on oil and more environmentally friendly. Biorefinery operations enable components from biomass to be extracted, isolated and modified in order to produce gaseous or liquid fuels as well as specialty and commodity chemicals. The latter may in turn be converted into biomaterials. This Post Master program is based on the scientific expertise of Grenoble INP-Pagora as a result of its innovative research in plant chemistry and its strong links with industries. Lasting one year, this degree program includes a semester devoted to classes, conferences and site visits as well as a semester research project carried out in a company. This Post Master Degree program covers the entire chain from biorefinery to the production of bioenergy, bioproducts and biomaterials. This whole chain is today considered as the most exciting and efficient move towards a sustainable society and a provider of new job opportunities.